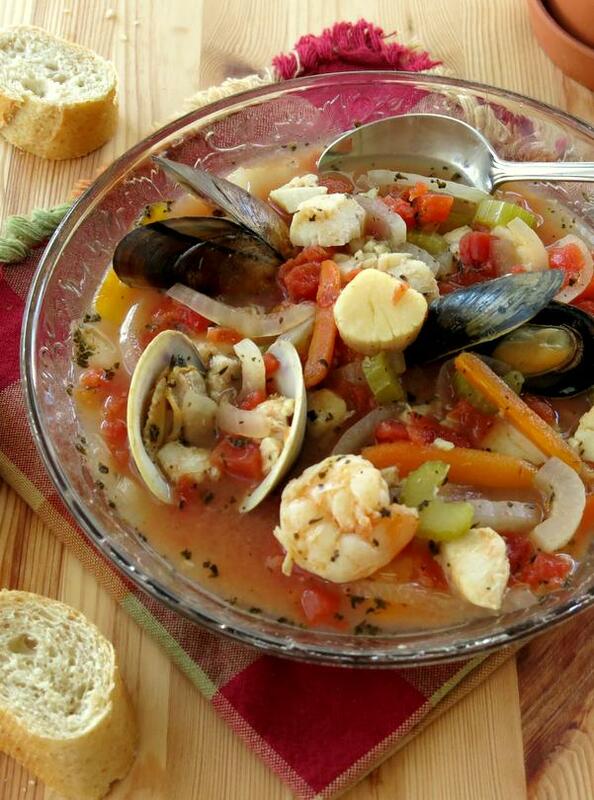 Italian Seafood Soup or Cioppino is an elegant, one-pot dream come true. It’s chock full of seafood and flavor, low calorie, low-carb and easier to make than you could possibly imagine! 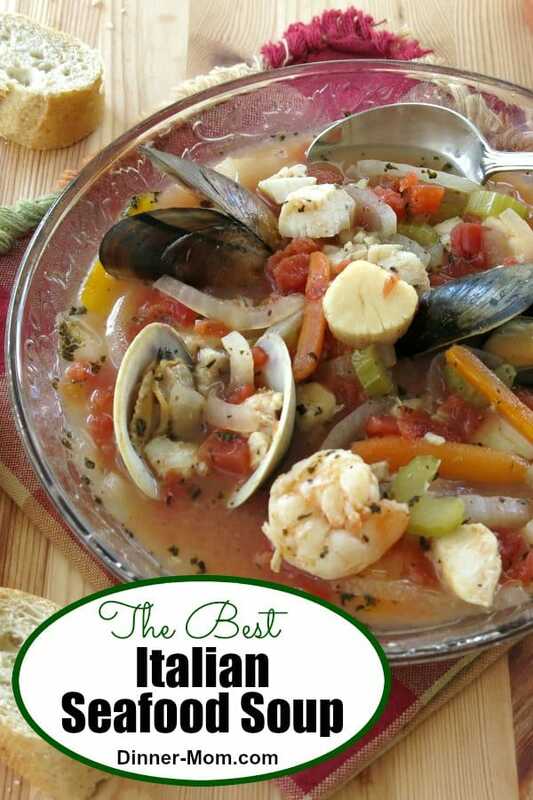 We had this delicious Italian Seafood Soup last Christmas Eve. It was divine and I could hardly wait to share it. But, I did. I waited. I wanted to save it for the “perfect” night. Am I the only one who ends up having splurge dishes, like Broiled Scallops with a Parmesan Crust, Shrimp Couscous Paella or Crock-Pot Beef Bourguignon once or twice a year? Upon further reflection, I decided this recipe should not follow the path of fine china or holiday dishes…the ones you only pull out for special occasions and guests. I’m all about celebrating every day and savoring life’s moments big and small. So, I promptly prepared another pot of seafood cioppino soup, for lunch no less, and took some pictures. It really wasn’t much of an ordeal. It takes about an hour to make this one-pot soup and a good part of that time is hands-off simmering. We thoroughly enjoyed it for lunch on Saturday. 🙂 It was sort of my own personal declaration that any day is a good day to enjoy a delicious meal you love with family and friends. Allow the vegetables and spices to simmer and meld together for a full 30 minutes. I’ve shortened this step when making Homemade Vegetable Soup…and I am always disappointed. Since pricey seafood is involved, don’t make that mistake. Don’t be scared to use live mussels and clams. They are a fun addition to this stew and very easy to work with. Tips for working with Clams and Mussels: Buy them alive and store in the refrigerator in a bag that is open just a bit so that they get some air. When you are ready to cook them, if they are “closed” then they are good. If they are open a bit, then they might not be. Tap them on the counter and if they close up, then they are still good. The ones that don’t open need to be tossed. Ours were already cleaned when I purchased them. Check with the store where you buy them for special instructions. All that being said, you can easily substitute a can of clams. Don’t forget a good thick bread to sop up broth! 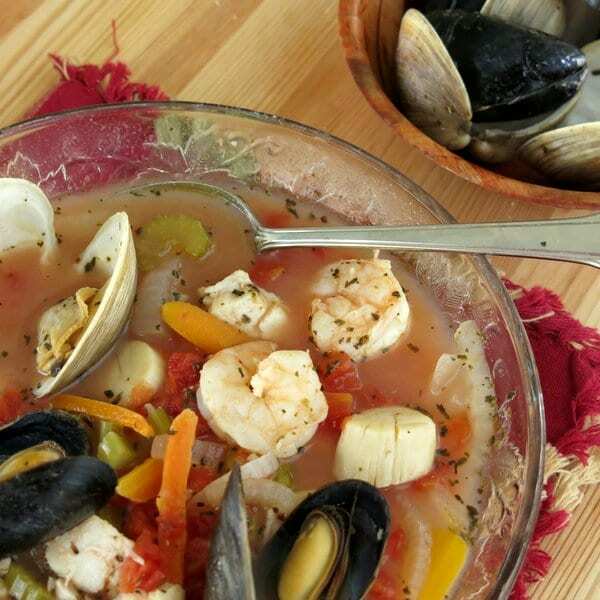 Italian Seafood Soup or Cioppino is an easy, elegant, one-pot dream come true. It's low-calorie, low-carb, gluten-free and delicious! Add onions, garlic, carrots and celery to pot and saute for about 5 minutes or until tender. Add tomatoes, broth, wine, basil, thyme and oregano to the pot and stir to combine. Stir in the seafood and bring to a boil. Reduce heat to low and simmer for about 5-7 minutes or until seafood is cooked through and clams and mussels have opened. Such an easy and healthy recipe…definitely need to find an occasion soon! 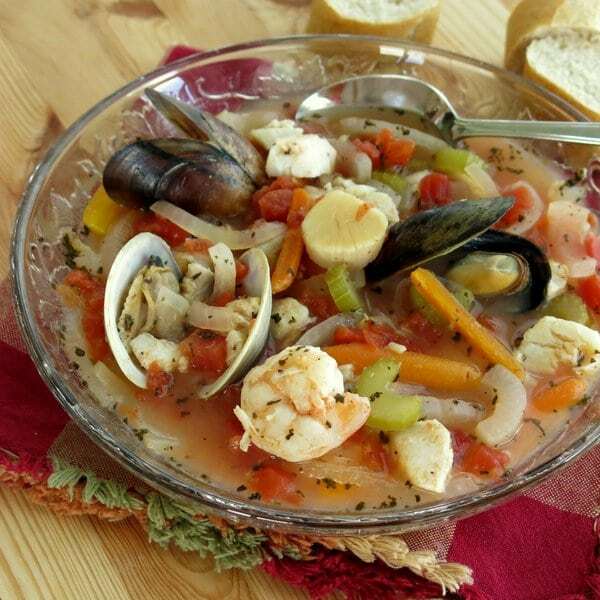 I love seafood and this soup is perfect, I’m sure my family will love this one. 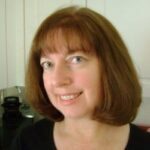 Thank you for sharing a great recipe and it really looks delicious, I’ve bookmarked it. Oh my goodness! I haven’t had Cioppino in so long. That needs to change right now! Your recipe for this traditional Italian dish is excellent. Yum. Yum! I’ve never had Cioppino but this looks incredible and I am definitely going to have to try it now! Yay! If you are a seafood lover, I’m sure you will enjoy it! I love your encouragement to think of this as an any day meal and not just for special occasions! Wonderful post and recipe.